Being the first chapter of a trilogy, The Last Airbender does not work as a stand-alone film, but might do fine in the grand picture – IF the other two even get made. Made for fans of the Nickelodeon series and kids between ages 6 and 14. Rated PG for fantasy action violence. The Last Airbender (based on the animated series Avatar: The Last Airbender) suffers the same problem as 2007’s The Golden Compass: it doesn’t quit do anything for itself. But if the following chapters of the story are ever made in movies, then it has the potential of being something good. Considering the amount of negative reviews it is getting, it is probable that the other two chapters will never get made. In a world not unlike our own, there are only four different races – each one possessing the magical ability to control a different element. Waterbenders can conrol water in all of its physical states whenever it is present. Earthbenders can move the ground beneath their feet, causing it to rise, sink or fly through the air. Firebenders can move existing to flames to their own command. Airbenders move their winds in any way they see fit – but genocide has left the world void of their people for a hundred years. The four different nations created a harmonious balance with nature prior to the Airbender extinction. Not wanting to conform to the traditions of their forefathers, the Fire Nation destroyed the Airbenders, believing that the Airbending tribe possessed the powerful reincarnated spiritual leader – known as the Avatar – that joined all the nations in peace. For 100 years, the Fire Nation has been searching the globe for the reincarnated Avatar. The movie opens with a brother and sister pair – Sokka and Katara, respectively – of Waterbenders in search of food in their arctic homeland. In the middle of their hunt, they notice a glowing ball of light beneath the ice. When Sokka (Jackson Rathbone, The Twilight Saga) disturbs the glowing orb, it rises from the ground, shatters and sends a beaming pillar of light into the daytime sky. Inside rests an unconscious boy with unique tattoos resembling those of the extinct Airbending Nation. 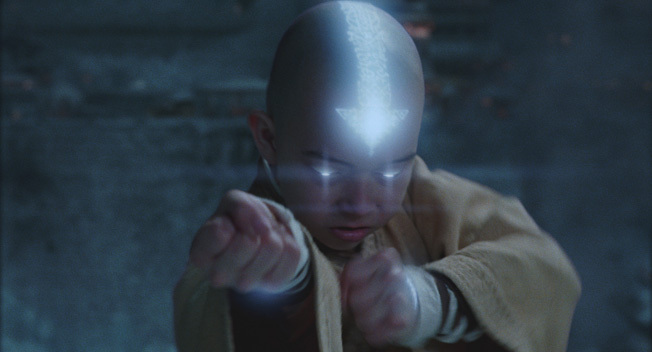 Not only is the boy inside, Aang, the only survivor of the Air Nation, but he is also last reincarnation of the Avatar. Being the leader that the Fire Nation has been actively seeking to destroy, they begin to hunt Aang and his newfound friends. A lot of reviews are eager to bash on the mediocre 3-D transfer of The Last Airbender. Know that while it is better than Clash Of The Titans’ 3-D, it is still flawed and highly unnecessary. Just see in it in the standard 2-D – it will save you a mild headache and few bucks. Written by M. Night Shyamalan (The Sixth Sense, Unbreakable, Signs, The Village, Lady In The Water, The Happening) – whose career went from “amazing” to “awful” in nine short years – the screenplay suffers. The characters are shallow and undeveloped and the movie flows at a poor, inconsistent pace. But being directed by Shyamalan, it looks great. The shots give justice to the beautiful locations and long takes make the action sequences fresh and unique. If only M. Night would allow a veteran writer to revise his scripts prior to shooting! Had that been the case, both The Last Airbender and The Happening (which story has great potential) could have been critically acclaimed films. Instead, The Last Airbender comes across much like Matthew Vaughn’s Stardust – being a passion project based on a loved book, it appeared that he worried too much about keeping it exactly like the book and not enough on making it work in the given medium, film. The Last Airbender tries too hard to capture too many elements from the first season of the series while it should have been trimmed down and changed to work on the big screen. Cormac McCarthy, author of The Road and No Country For Old Men, told director John Hillcoat to make whatever changes necessary to The Road in order to make it work on film. McCarthy was willing to let someone else rewrite his Pulitzer Prize winning novel to make it a great film. He recognizes the differences between the two different mediums, and so must Shyamalan in order to make The Last Airbender into a successful series. But even as mediocre as The Last Airbender is, it still has a chance to be great – but there is a great big “if” in its way. If people go out and see it, if it is a box office success, and if the studio thinks it has a successful future, they might green-light the other two films. Only time will tell.